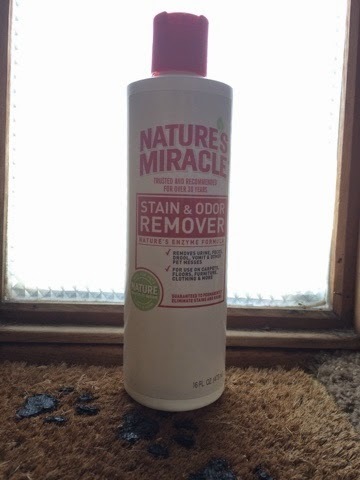 Whether your pet is potty training, getting a little old to make it outdoors, or just simply has a little accident - Nature's Miracle has got your back with their Stain & Odor Remover. Venus is a middle-aged dog, past the potty training stage but surely young enough to make it out and about, but that doesn't mean she wants to go out in this cold winter weather! Accidents happen, and when they do, Nature's Miracle Stain & Odor Remover is the perfect product to have on hand. It breaks down proteins and bacteria from feces, urine, vomit (you get the idea...) - even dirt and grass! You know what? This stuff isn't half bad to keep around if you've got a kid around your house either! This Stain & Odor Remover eliminates the stain and odor, not covering it up, to prevent your pet from marking in the same area later on. This product has been a miracle for those tiny accidents caused by our sweet baby girl, and even a couple from our human son too - total carpet saver right here! You can find the Nature's Miracle: Stain and Odor Remover at Chewy.com in several different sized bottles to fit all your odor and stain eliminating needs.